A Swedish American in Sweden: "Escalator Temporarily Stairs. Sorry for the convenience." Legs burning. Churning. Up. Down. Head up. Head down. Breathing. Through my nose. Through my mouth. Sweat beading. Legs burning. Churning. Every morning. This has been my life this week. I’m not training for a marathon or anything. Because as we all know, the greatest trick the devil ever pulled was convincing the world that running was a good thing. No, I’m jut trying to get to the library. 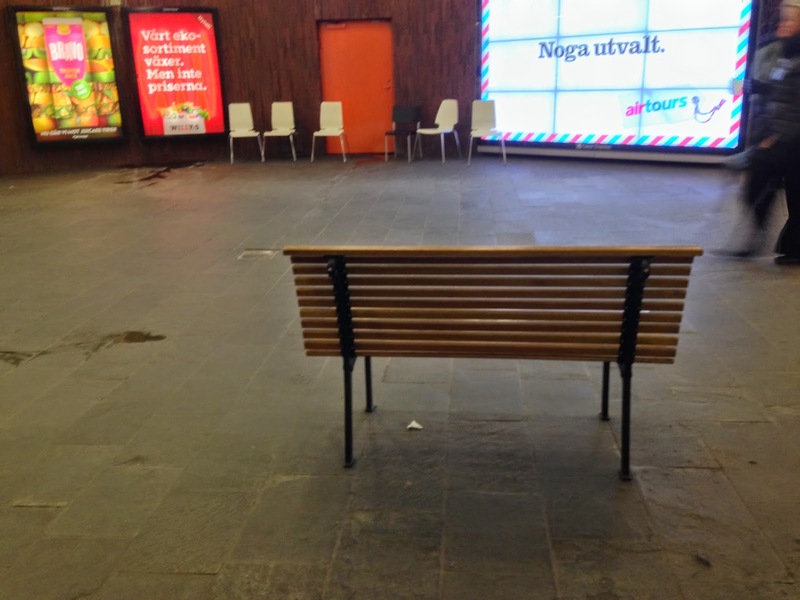 The escalators at Östermalmstorg have been shut down since February 14, Alla hjärtans dag. That day, a day of love, roses, and chocolate, a woman was on the escalator when a step collapsed and her leg got stuck. She spent more than an hour trapped in the step of an escalator. So that’s a thing that can happen, apparently. 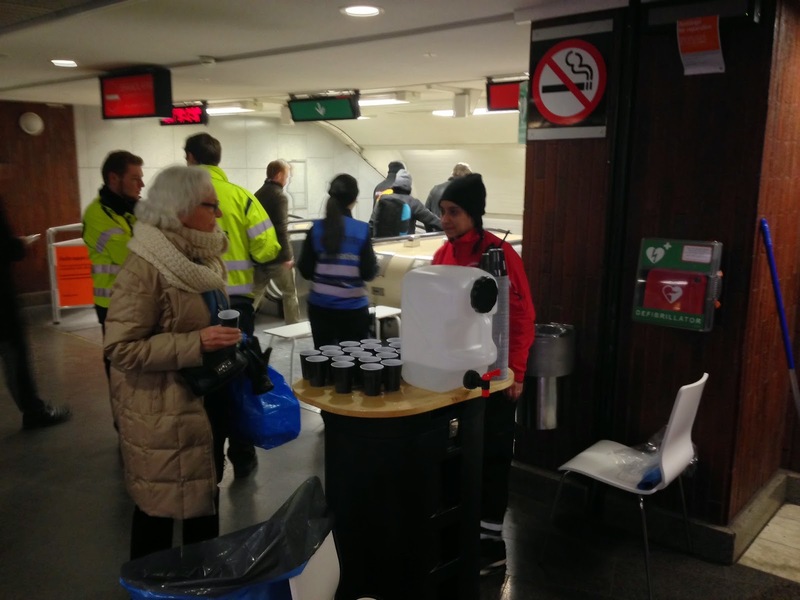 In response, SL has shut down 39 escalators in 11 different Stockholm stations for safety reasons. That’s a whole lot of broken-down escalators. This is where the late, great Mitch Hedberg would pop in and remind everyone that an escalator can never break down. It can only become stairs. Of course, at Östermalmstorg, it becomes over 150 stairs. And there’s a reason that gyms have machine that simulate stairs. Those things are hard work. So much hard work that SL, in its infinite kindness, has taken to setting up rest stations. Halfway up the now-stairs, there are several chairs and benches. Because, despite their slim and trim physique, it turns out the Stockholmers maybe aren’t in as good of shape as their tight tummies would suggest. SL seems to be suggesting, gently, that maybe, just maybe, you should set up camp here. Try for the summit in the morning. You’re close, but you need to acclimate to the change in elevation. Notice the absence of people resting. The stubborn Swede refuses to show weakness. Once you’ve arrived at the top, there is a water station. It’s as if you’ve decided to enter a fun run. Minus the fun. And the run, for that matter. The first time I noticed the water station, it was just standing there, available to people who might need a bit of water after their trek. The next time, they had stationed the water just in front of the now-stairs. They were handing a cup of water to every single person coming up the stairs. I was half expecting someone to dump the water on their head, raise their hands in victory, and then fall to their knees as they crossed the finish line. Instead, it was just a lot of heavy breathing, awkward smiles, light sheens of sweat, and fumbly attempts at removing clothing. Kind of like a high school date. Running out of water during rush hour. There's no telling how much time we have left. Please send help and a better photographer. There’s no date yet as to when the escalators will be up and running. Until then, Stockholmers will be working up a sweat on their daily commute. In fact, this could just be an elaborate ruse to force people to use the stairs so that they get an extra bit of exercise every day. Very sneaky, Stockholm, very sneaky. Welcome to Sweden. And out-of-shape Swedes. I wondered what was going on. I live right over this station. I hope the hiss keeps running because my heart can't take 150 stairs. There is so much trash and gum on those dirty escalators I thought it had just chewed too much detritis and jammed. I hope it doesn't take two years to fix - like everything else in Stockholm. I'm starting to wonder. I was out of town for several days and came back to, yup, escalators in the form of stairs.